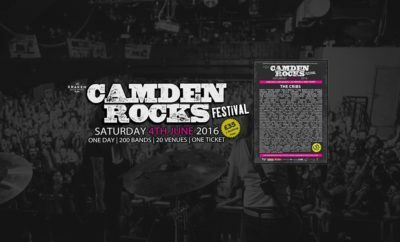 Camden has a remarkable ability to feel alive no matter when you visit, but when Camden Rocks hits town, it’s really something else. The day starts as many London days do, but by the end, we’re left in no doubt that this is something really special. The line-up this year showcased essentially everything great about the British music scene. From the old favourites we’ve always loved, to the new kids on the block; it’s the UK’s time to shine (and Camden Rocks knows it). We start out the day with Zoax. We’ll admit – from their recordings, we’re expecting altogether more melodic, but once you get over the fact that it looks like their singer is having a bit of a fit; they’re every bit as exciting as we want them to be. If you’ve not given these guys a listen yet, you’re kind of doing things wrong. When waiting in line for something-or- other (these things are often a blur…) we’re greeted by a couple of chaps trying to entice us to see their band. These gents were none other than members of Cope, homegrown alt-rock hailing from London itself. We’re never ones to turn down new talent, and it certainly wasn’t a wasted 20 minutes in checking them out. InMe have always held a special place in our hearts, and today is no different. It’s amazing when you get to see a band who are so familiar that they feel like home, and no matter how many times you hear them, they still manage to captivate. Keeping fans enthralled for the best part of twenty years is no easy feat, but these guys manage with ease. Sonic Boom Six absolutely stole the show for us. If you’re not familiar with this lot, change that right now. Let’s get one things straight – they may well be reggae and they may well be ska, but what they also are is, in a word – fascinating. From their politically infused musi-rants, to their passionately charged speeches in between, we couldn’t take their eyes off them (or help dancing along with the ever-awesome Laila K, their feisty frontwoman). We somehow manage to miss Creeper – as is often the case at festivals like these – but from the buzz we hear throughout the remainder of the evening, they’re well and truly onto something good. Yashin add another stellar performance to their now never-ending repertoire, but we miss to much- anticipated Young Guns because there’s simply so many other bands to hear. They slayed at Slam Dunk just one week earlier; and we doubt this would be any different. Regardless; we finish the night off quite nicely with Shvpes. Crammed into a tiny little basement in The Dublin Castle, the absolute sweatbox of an atmosphere only adds to the authenticity of the movement. This is a band who’re growing – rapidly – from the ground up, and we can’t wait to see where they head next. A perfect end to a perfect day!